Elephant Ears!!! - Forums Elephant Ears!!! I never thought I'd see someone here in the South BUYING Elephant Ear bulbs-LOL! They are bushy plants with large leaves and the over take ANY area!!!! They didn't need to PAY for Elephant Ears.... they could have come over to my place and just brought their trowel-LOL! So tell me other than plucking them up by the roots, which is really hard because they are in the ground so good, how do you get rid of Elephant Ears? They are baby Elephant Ears now but I am plucking them out daily. Something has got to give!!!!! Any ideas? I've never heard of them, but they sound like bamboo--pretty to look at, but boy, they sure can take over. Reminds me of the people with no friends--you know, the ones buying grocery store zucchini in August! 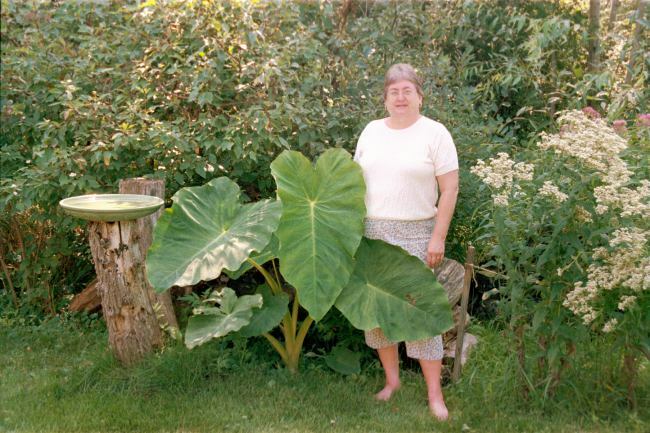 Katrack - it's what we call caladiums, BIG ONES, if that helps you. I have no idea about getting rid of them. And for anyone wondering - that's not me, just a lady I found online. Well, if they weren't an invasive pest, I'd say that is a very attractive plant. I've lived in the arrid west almost my entire life and am fascinated with tropical plants that seem to grow themselves. 2boys2luv..... thank you for clarifying that was not you-LOL! And by the way the lady pictured with the elephants ears (plants that is...) that is NOTHING!!! Half of our driveway was covered in ELEPHANT EARS. Just wait a few months... contact that lady pictured... and she will have ELEPHANT EARS all OVER-LOL! They do come in handy for play "fans" for kids who want to play Queen of Egypt and be a servant and fan the Queen-LOL!